City of Riverside - My Play club - Irvine, Woodbridge, Northwood | Vistem Solutions Inc. The Arc of Riverside Countyâ first My Play Club Summer Day Camp for children with special needs and their siblings was recently held in Reid Park in Riverside with the help and guidance of the Riverside Parks and Recreation Department. By all accounts it was a great success and the primary reason was the collaboration of many organizations and volunteers who helped plan and conduct this one-week camp. Fifty spots were opened several months prior to the camp and thanks to social media and the network of families participating in the monthly My Play Club at Fairmount Park, reservations were filled in less than 24 hours. In all, 57 young campers attended and the Arc was able to offer this event free of charge due to fundraising activities leading up to the event. This camp was only possible because of the generosity and help provided by the Riverside Parks and Recreation Department. The Springbrook Clubhouse at Reid Park was a great location and the campers were provided a free lunch each day. Veronica Mendoza, a special needs teacher from Moreno Valley, was the Summer Camp curriculum coordinator. Clara Garcia, a mother who created a Facebook page called Special Needs Community that has about 700 members, and who has been vital to the growth of My Play Club, was the camp director and chaired the volunteer organizing committee. 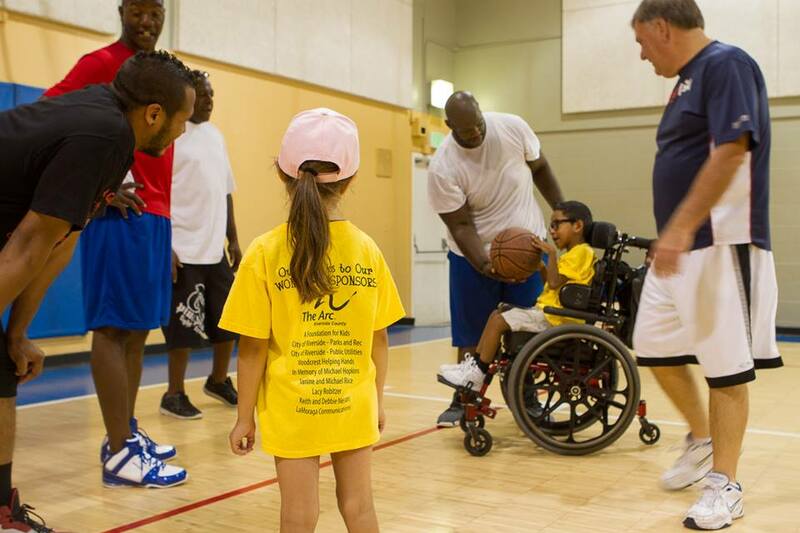 Each morning the campers would participate in an activity accompanied by their parents. These activities included ceramic art, a basketball clinic with the Special Olympics basketball team, a carnival day, horseback riding at Trax Equestrian Center, and a pool day and barbecue wrapping up the last day of camp. Riverside Special Olympics coach and trainer Keith Nelson supervised the basketball team as the champion Special Olympians coached and mentored some enthusiastic campers. The Riverside nonprofit agency, A Foundation for Kids, was a key contributor to the camp by donating goody bags for every camper, raffle prizes for the parent room, and all of the equipment for our Wednesday carnival in the play area behind the Clubhouse. Danielle McQueen, a top manager of this nonprofit agency, personally supervised the carnival event along with CEO Mark Chow. The campers visited the Trax Equestrian Center on St. Lawrence Street on Thursday and had a great time riding around their track. Owner Karen Davidson and a sizeable group of Trax volunteers made sure the kids were safe and had fun. Each day, after lunch at the park the children would head back to the clubhouse and begin their classroom activities. This years camp had a superhero theme so many of the activities involved masks, capes and an obstacle course. During the classroom hours parents were invited to spend time in the parent respite room. Here, parents could network with one another and learn valuable information regarding their special needs children. Some parents could not contain their enthusiasm for the camp. Redlands resident Maia Pawooskar, whose son and daughter attended the camp, said, We feel privileged to have had the opportunity to participate in this very first very special My Play Club Summer Camp. The overall atmosphere of support, love, friendship and acceptance was so abundantly apparent, said Michelle Villa, whose 3-year-old son was part of the event. Our family enjoyed meeting new friends and had a fantastic time. I cried many tears of joy seeing Julian experience camp and interacting so well with his fellow campers and staff,Villa added. The Arc of Riverside County is looking forward to raising funds again this year to continue with this much needed summer activity for children with special needs. My Play Clubs second annual Rock and Roll fundraiser and Disability Resource Fair is Oct. 19 in Fairmount Park and it hopes to repeat the success of last years event. Meanwhile, The Arc of Riverside County continues to hold My Play Club, a play date for children with and without disabilities, at Fairmount Park every third Saturday of the month for the rest of the summer. To learn more about My Play Club and next years summer camp, please contact Erin Whitt at ewhitt@arcriverside.org.